Michelle D. Sherman, Ph.D., is a licensed clinical psychologist and a nationally recognized expert on the effects of trauma and mental illness on the family. After directing the Family Mental Health Program at the Oklahoma City VA medical center for 16 years, she is now a Professor at the University of Minnesota-Twin Cities. She graduated from the University of Notre Dame and later earned her doctoral degree in clinical psychology from the University of Missouri at Columbia. Dr. Sherman has worked extensively with families dealing with a range of traumatic experiences, including military combat, domestic violence, and sexual assault. She co-chaired the American Psychological Association's (APA) Presidential Task Force on Military Deployment Services for Youth, Families and Service Members, and is a Fellow of the APA Division 43 (Society of Family Psychology). 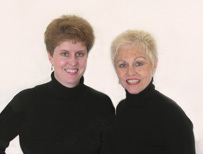 DeAnne Sherman, Michelle's mother, is a French teacher, trained dancer, and choreographer. She graduated from the College of St. Catherine in St. Paul, Minnesota, where she received degrees in French, education, and speech and theater. She owned and operated a dance studio for ten years where she worked extensively with teens and young adults. In addition to being an experienced public speaker, DeAnne also volunteers her time teaching and mentoring junior high and high school students in the performing arts. DeAnne's mission is to educate, affirm, encourage, and cherish each of her students, whether it is in the classroom, in the dance studio, or on the stage. In her free time, she enjoys exercising, traveling, and speaking French with her grandsons. The collaboration of psychologist and teacher, daughter and mother, brings true synergy to their work; the authors draw from and pool their personal and professional life experiences in creating their books. We would be happy to customize a training program for your needs. Workshops could last one hour, a half a day, or a full day. Please email us at authors@seedsofhopebooks.com to discuss your needs and the range of training options.